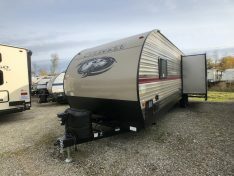 This New Bunk House floor plan for 2020 by KZ Spree Connect is a 27ft, one slide out, with an outside kitchen. Enter the 271BHK connect in the back where to the left of you is the double over double bunks along with a walk-in pantry. The bathroom sits next to the bunks with a tub/shower, sink, and foot flush toilet. 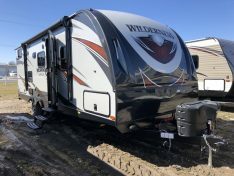 The Slideout is in the main living area, with a sleeper sofa and dinette. 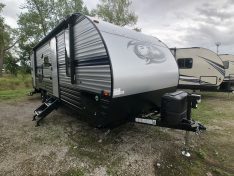 Directly across from the slide out is the entertainment center and full kitchen with an l-shape counter, 3 burner cook top, oven, and Gas/electric refrigerator. The master bedroom sits in the front of the 271BHK with a 60×80 queen bed and plenty of walk around space. 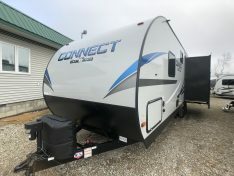 The outside if the 271BHK Spree Connect has a 17ft power awning with Led lights, and a mini outside kitchen with a refrigerator, two burner cooktop and sink.